Track every user interaction to see what performance improvements will bring you the most revenue. Ensure your site is up and running on all devices to catch issues before your customers do. Analyze the behavior of your third party tags and calculate their cost to your site’s speed and revenue. Follow your customer journey and track your KPIs, campaigns, and A/B tests in real time. Build and manage your Content Security Policy to keep your site safe from data breaches and ad injection. Black Friday online sales reached $6.22B. That's a 23.6% increase from last year. But with the increase in shopping activity, many retailers experienced website outages and slow-downs, including Lowe's, Walmart, and J.Crew. 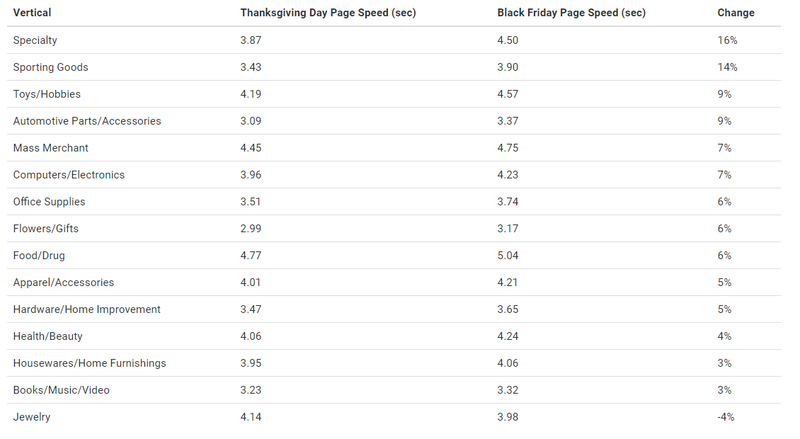 Collectively, the top 500 eCommerce sites slowed down by 6% on average between Thanksgiving Day and Black Friday. 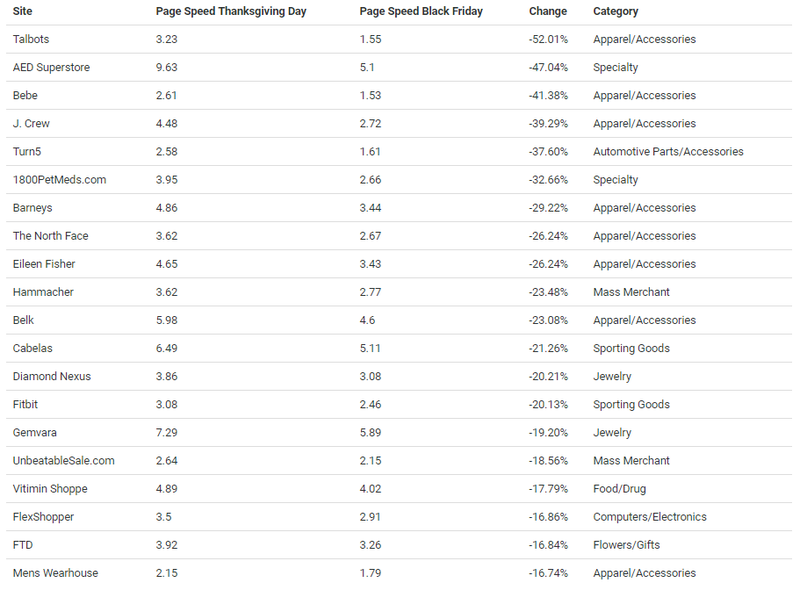 To make matters worse, IBM Digital Analytics (formerly Coremetrics) had an outage on Black Friday that caused website slow-downs at major retailers, including Dillard's, Victoria's Secret, and Tractor Supply. This report is based on Home Page measurements run by Blue Triangle's Synthetic Monitoring. 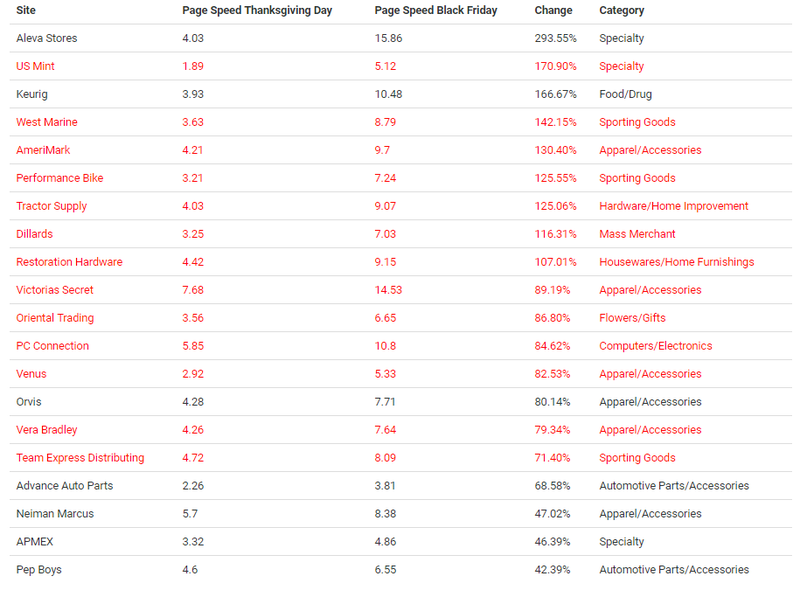 Rank the speeds of the Top 500 eCommerce sites Black Friday - Cyber Monday. 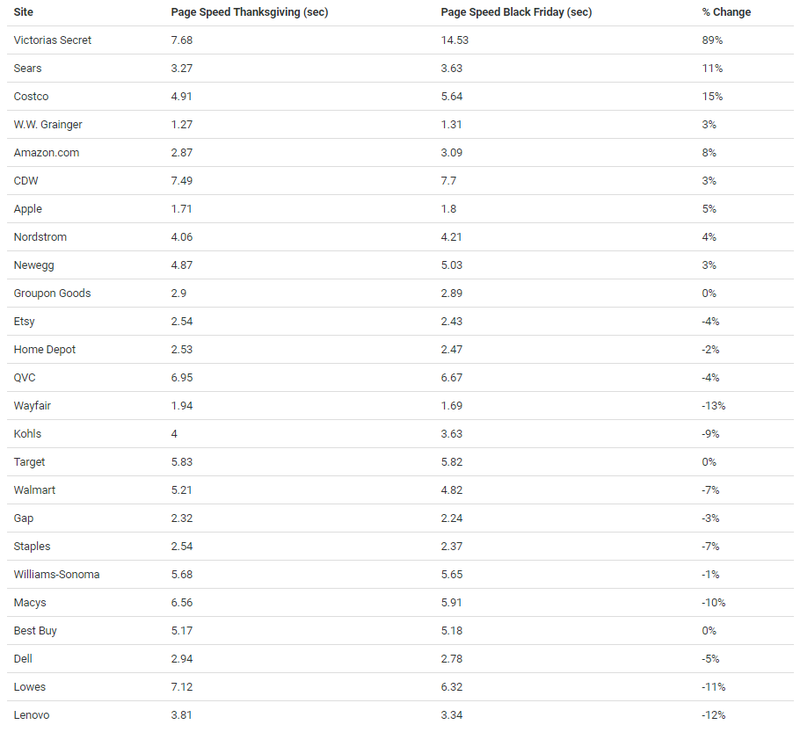 Nearly every retail vertical experienced slow-downs between Thanksgiving Day and Black Friday. This was due to the IBM Digital Analytics (formerly Coremetrics) outage that impacted the website's load time between 9:00am EST and 4:00pm EST.The Victoria's Secret website slowed down by a whopping 89%. The sites in red indicate those impacted by the IBM Digital Analytics outage. Blue Triangle is working with major retailers like The Home Depot and Lenovo this holiday season to ensure peak performance and optimal revenue.